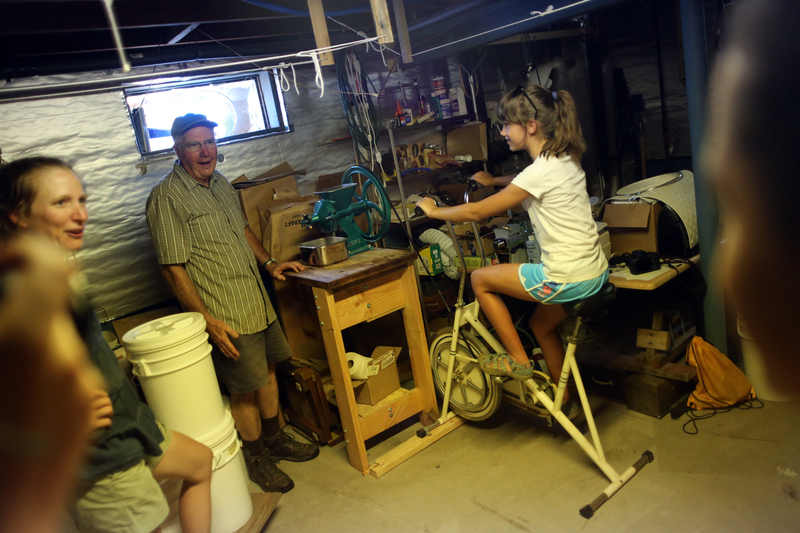 When Ellie Markovitch began organizing a Farms, Food and Photography Teen Camp the Agricultural Stewardship Association and the Arts Center of the Capital Region, she asked me if I wanted to do a class on pancakes. Of course I said yes because there are few moments I don’t want to talk about my favorite topic. In the midst of our July heatwave, seven teenagers walked up the hill from the Arts Center, and I met them by my patches of wheat and rye. I told them a little about my grains, when I planted them, and how they were growing. They snapped pictures, and held a grain head, comparing it to a weed I yanked. They bent to the gooseberry bushes and pulled off samples, and we went inside. It wasn’t much cooler, but at least there was no sun. 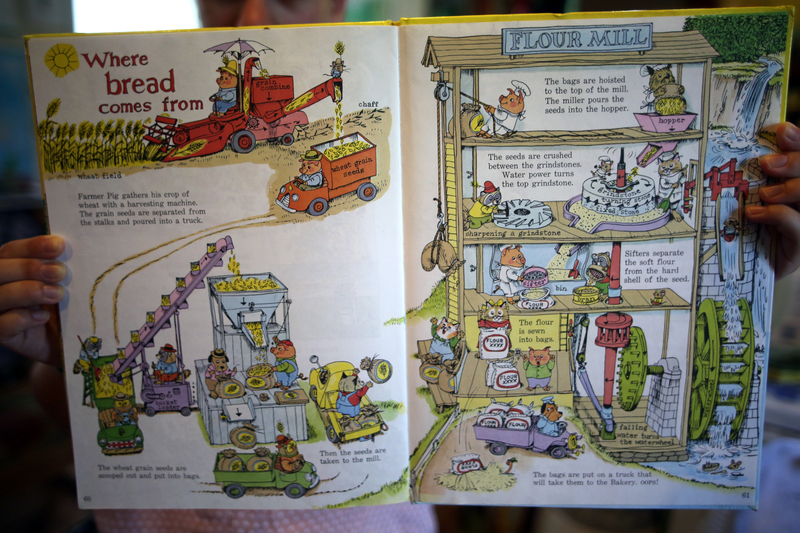 I had grains and flours on my kitchen table, and used a Richard Scarry book to illustrate the processes of harvesting and milling. 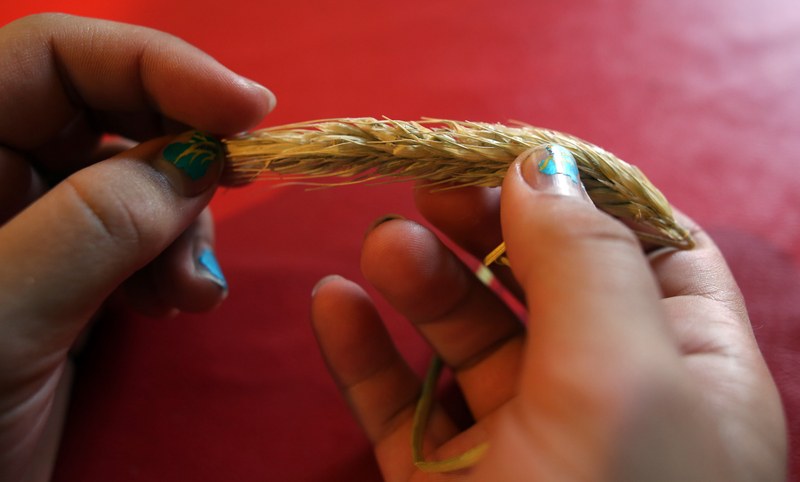 I talked about the westward migrations of wheat production, and how farmers in the Northeast are growing them again. Then we made crepes. Around my counter, the kids cut up cucumbers, onions, shiso and dill to make a filling for the buckwheat rye crepes I was making at the griddle. 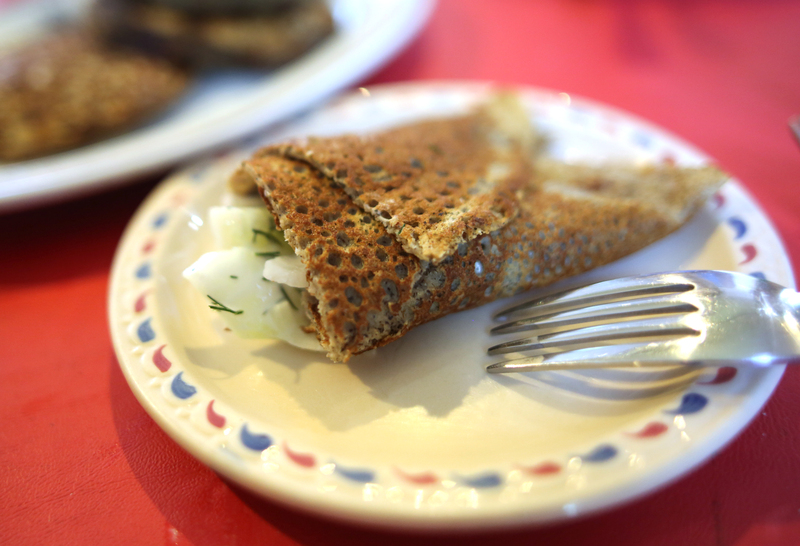 I mixed up buckwheat rye pancake batter to illustrate the difference between crepes and pancakes. Holly Butler from the ASA brought blueberries, so the pancakes were blueberry pancakes. 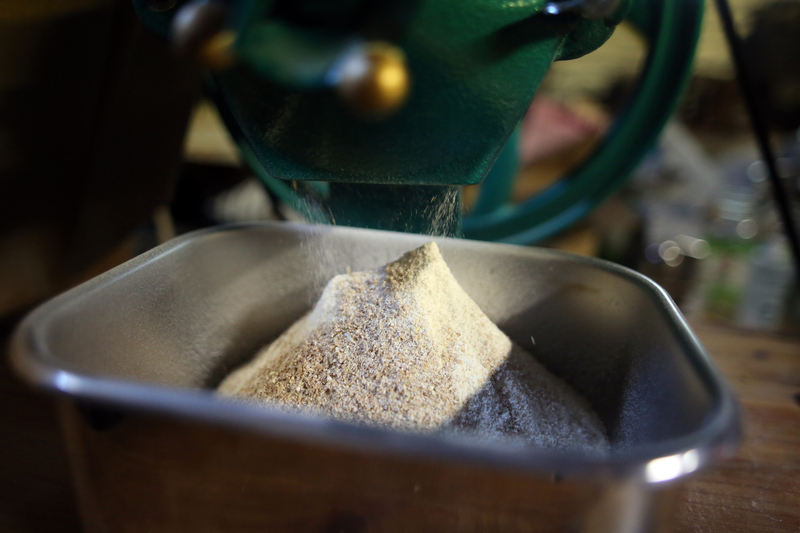 After devouring everything, we walked up to Howard’s to see and use his bicycle mill and the grains he’s growing – including rice. Thank you Ellie for inviting me to share my love for grains. What a gift. 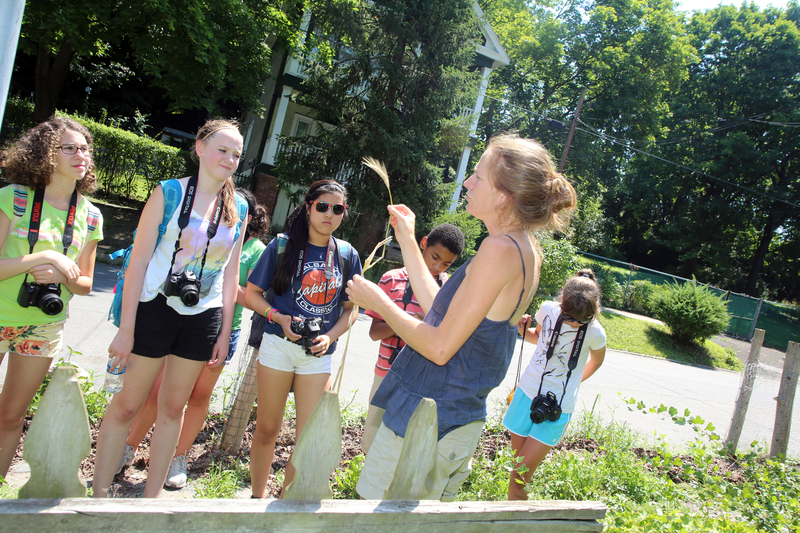 I also love seeing what these kids saw with their cameras – not just on grains day but through the entire two weeks of their camp, visiting food on farms in Washington and Rensselaer counties, cooking with Ellie, me and others. Check out the blog and see for yourself. Thanks ASA, and the Arts Center for making this opportunity happen. 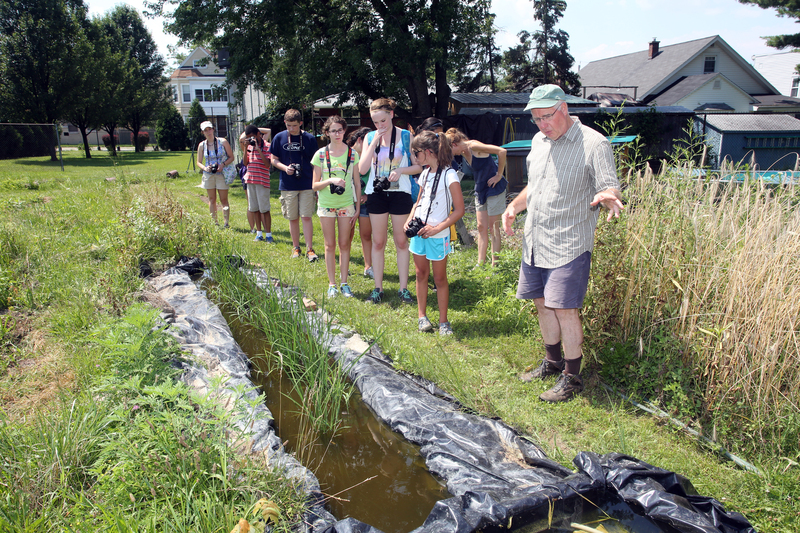 It’s such a gr8 program to educate young ppl with agriculture that relates back to the food! I love all the links that are happening — and this one was especially magic. Ellie has a great touch — helps people see things in a whole new light. I was wondering if it was possible to grow types of wheat in the Northeast. I live in Massachusetts and I connect any sort of farming to the removal of lots of rocks or running into big ones that can’t be moved without machinery. It has inspired me to do some research to see if it is happening in the local area. I would love to own some land to try different types of farming at some point. 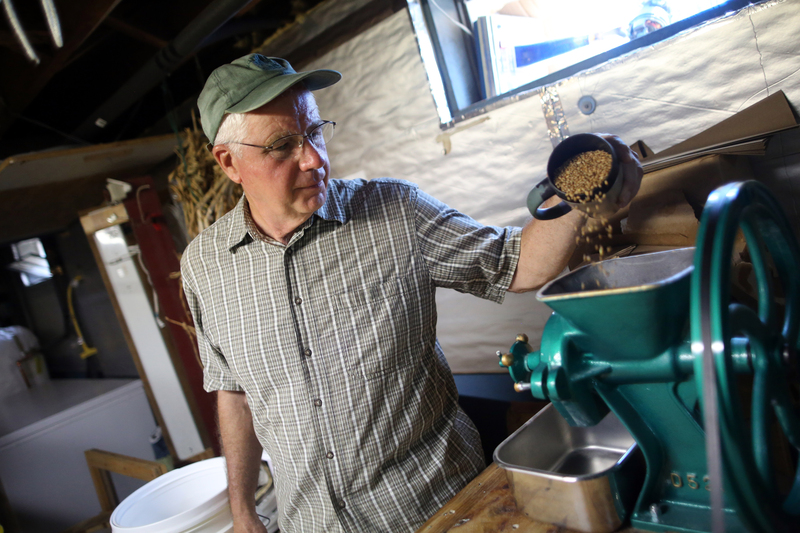 Sure — there’s a lot of people growing wheat in the NE. The Northern Grain Growers Association (http://northerngraingrowers.org/) and the New England Bread Wheat Project (http://umaine.edu/localwheat/) both have lots of info. Wow! It’s so nice to hear about kids being inspired on how to grow healthy food. Another article I’ve read just like this is from http://68anda6pack.com/2013/07/12/forking-good-exercise/. I hope you can drop by and see his take on gardening. Regards and more power!